This project, located in East Kensington, was a study in pushing boundaries. The small corner site offered opportunities for expression of both space and material on the exterior. On the interior, the plan is organized around a stair core that winds around a light well and pushes the building envelope out over the street. The clients for this project were two developers who were just beginning a business partnership. Each brought their own style and taste, as well as their own architects. Toner Architects took the lead on the building planning and spatial design, while Bright Common worked on the exterior appearance. The spatial experience of the building is dominated by the wood and steel stair that winds through the middle of the space. Its open shape helps bring light deep into the building. It projects out into a bay on the second-floor level, giving space back to the interior rooms. 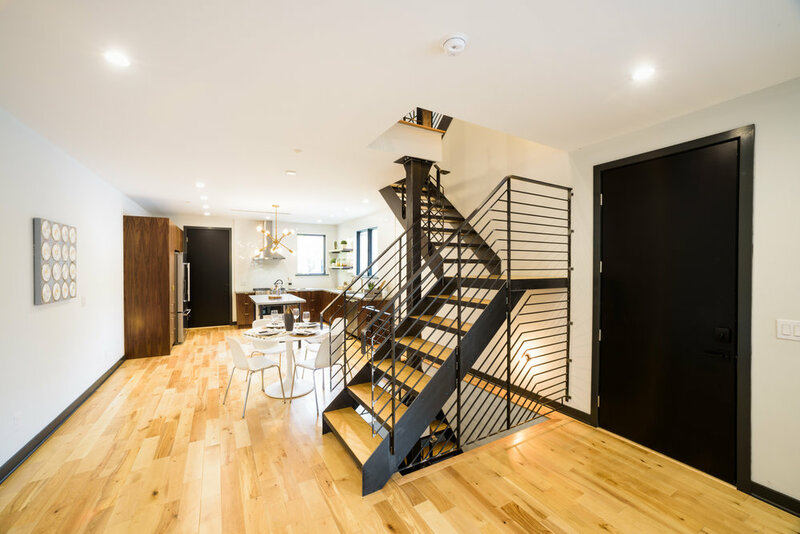 Secondary living spaces, both indoor and outdoor, sit adjacent to the stairs on the second floor. On the exterior, the building skin is weathering steel, set at various angles to accentuate the building geometry. This visual texture is a play on the variety of materials and shapes in the neighborhood, and the material is a nod to the area’s industrial past. Over time, the steel goes from silver-gray to dark brown.